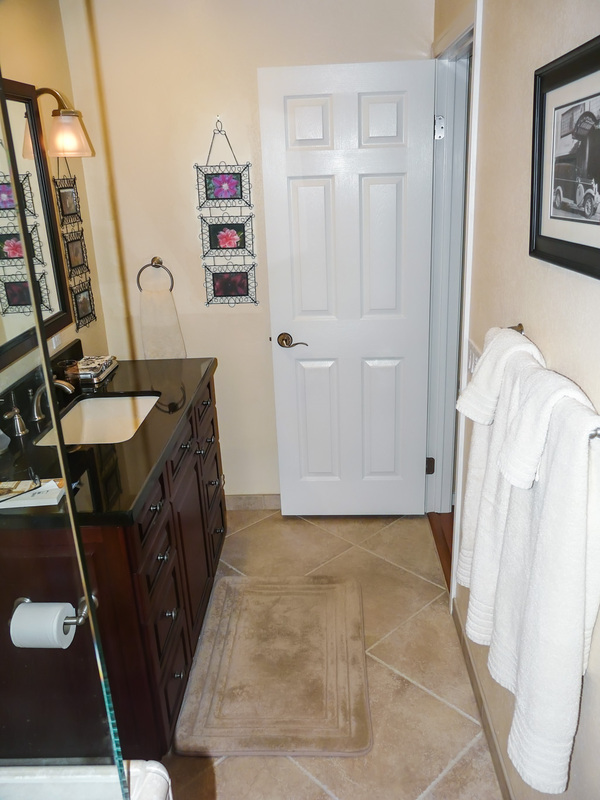 This bathroom is in a large upscale home that was built in the 1990’s in the Miramar Lakes area. This was the only bathroom on the first floor and it doubled as a powder room, secondary guest bathroom, and most importantly, a pool bathroom. When people come in from the pool, this is the bath they use to wash themselves down and shower off the chlorine. The client’s primary objective here was to make the room look a lot better. Even though the residence was constructed in an upscale area, as builders do, they put in the cheapest stuff they could when the home was originally constructed. 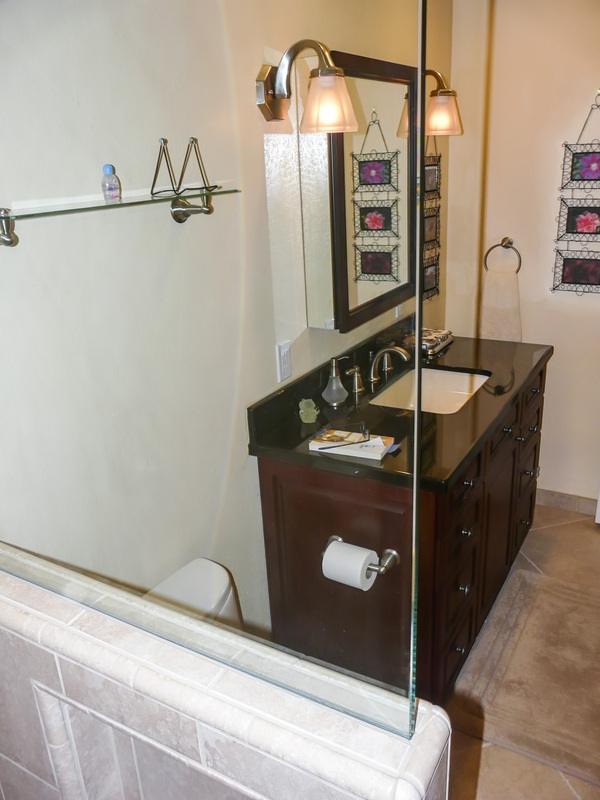 The bath had a tub and plain white tile with a typical builder’s sliding glass door, which was both hard to keep clean and not very attractive. The client had no need for a bathtub on this floor and really wanted to convert it into a shower to optimize its function as pool bathroom and double as a stylish powder room and secondary bathroom when they needed it. We redid the tub area and turned it into a shower. To most homeowners and professionals, that conversion may sound like a relatively simple conversion to implement, but in reality, it can be and often is a complex and expensive remodeling task. 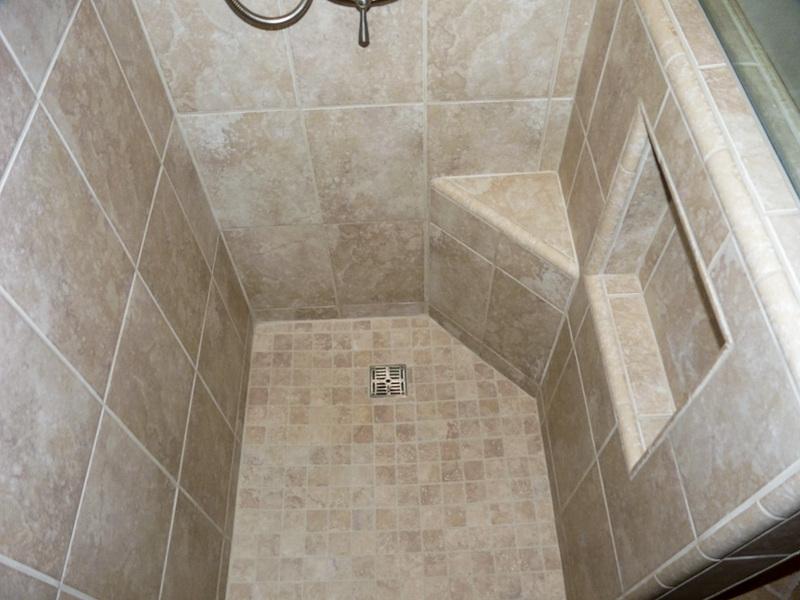 Per building code, a tub only has a 1 ½” drain line plumbed to it, while a shower requires a 2″ line. 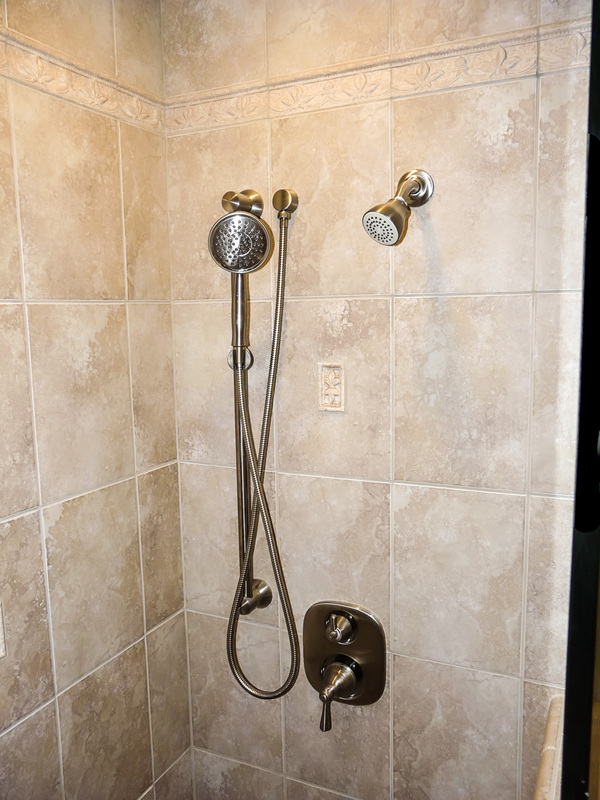 So changing a shower into a tub is a simple process since the existing shower has a larger drain than a tub needs, but going from a tub to a shower presents every homeowner with a conundrum: how far away is the nearest 2″ drain line? My 40 years of experience have taught me that the overwhelming majority of plumbers and other tradespeople simple tell the client it is not a big deal, they recommend the client just do the job without permits or inspections. That is simply not true. Getting permits for this work is always a good idea, but even if a client decides to forego the permit process, it is imperative that basic building codes be implemented so the homeowner does not expose themselves to the liability associated with not following code. In this instance, we had to open the floor slab, dig, and run a new 2″ shower drain from the tub to the main sewer line. Prior to the beginning the job we explored this worst case scenario and already knew the main line ran directly under the new vanity sink, so it was less than 6 ft. away and 4 ft down under the concrete slab. 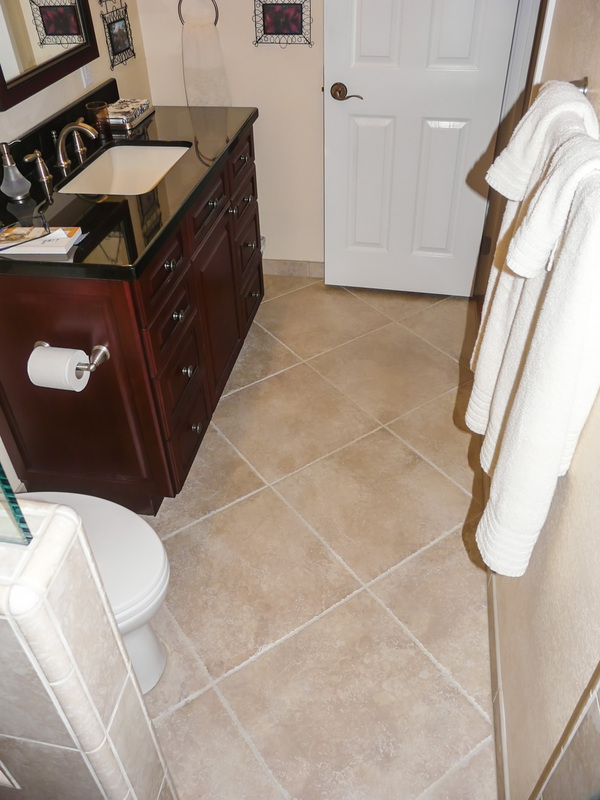 The client wound up choosing larger format 20″ porcelain tiles for the floor and smaller tiles with decorative trims from the same product line for the shower walls and floor. 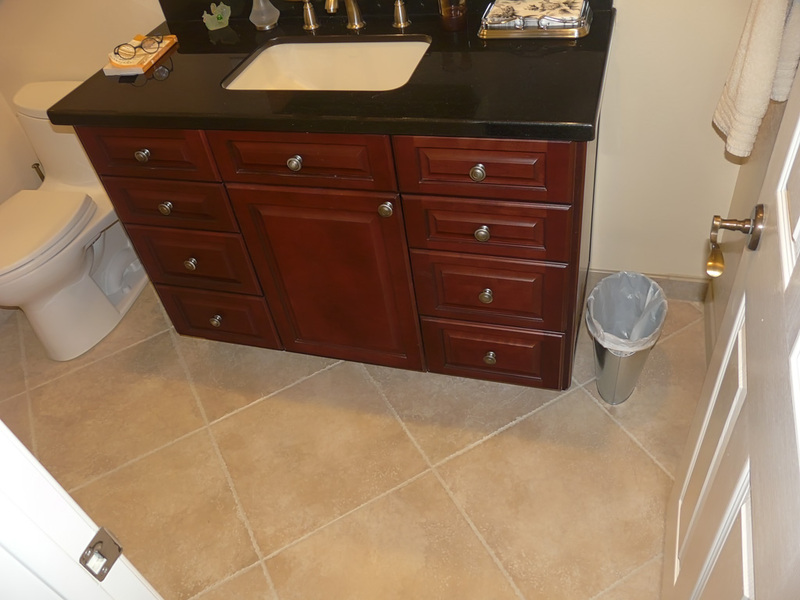 We built and installed custom real wood cherry cabinets with a black granite countertop and installed a Robern surface mount medicine cabinet to try to keep things off of the counter. 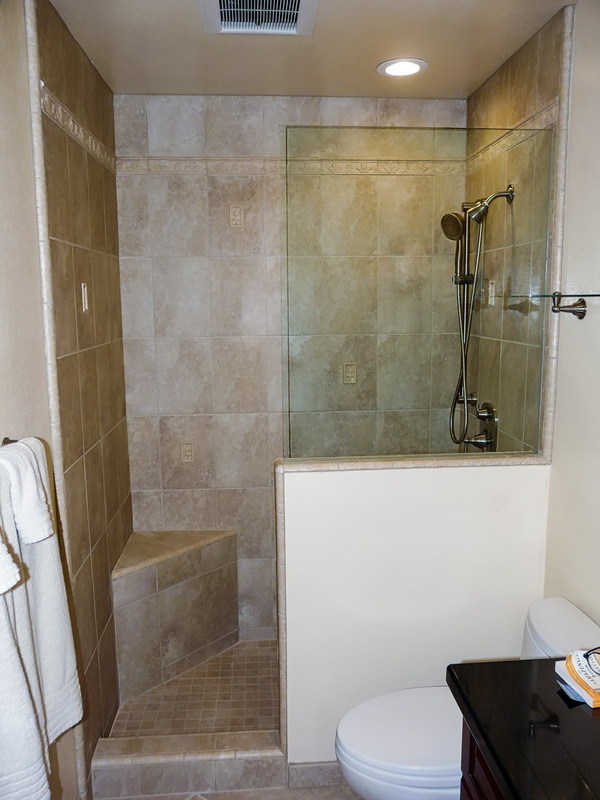 We also repaired non-working ventilators in this bath and two other bathrooms in the home that another contractor had recently installed but did not seem to work. Some of the elements of our functional bath design concept were not as important in this bathroom as it does not get regular daily usage, so the client chose to forego many them in this particular application. 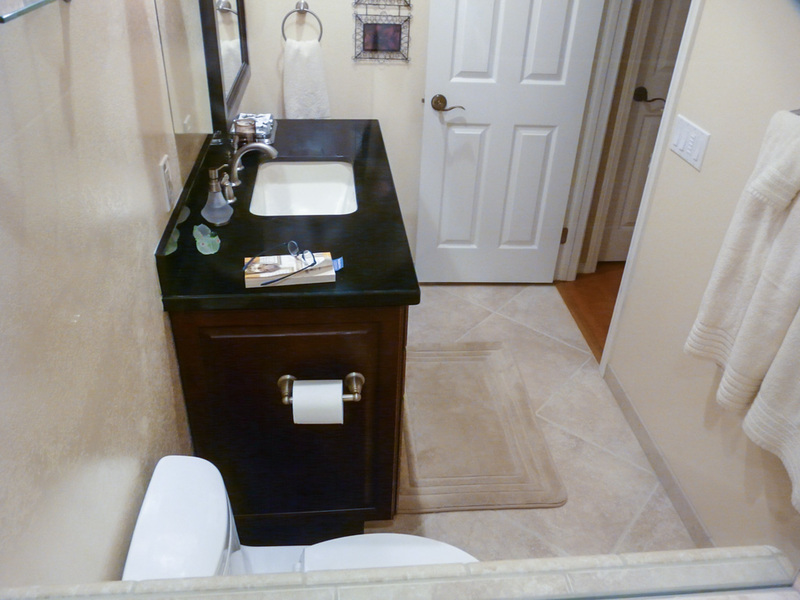 The cabinets are 36″ tall, so they do fit the functional bathroom mold, as does the design of the shower area. We created a 44″tall pony wall with a glass panel on it to keep water from splashing out. 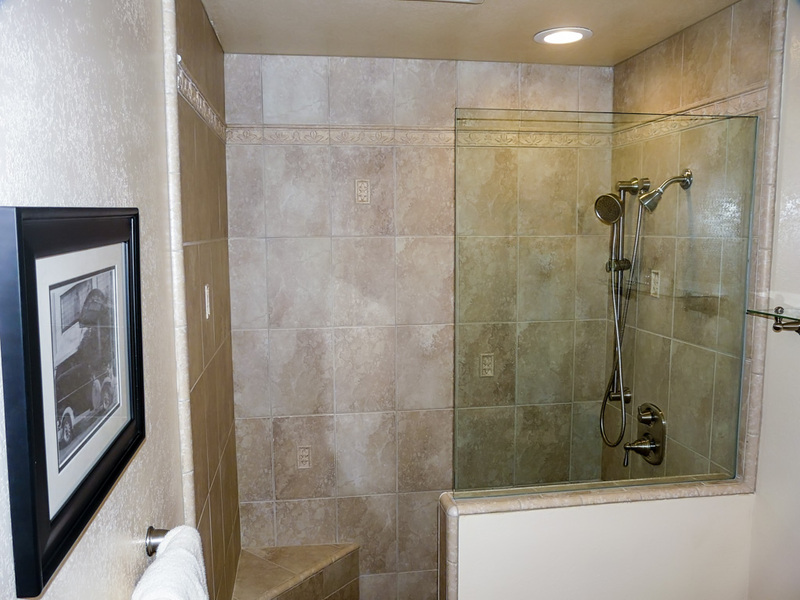 There’s no shower door, as showers of this size (60″ x 30″) have absolutely no need for a shower door if it’s done properly. 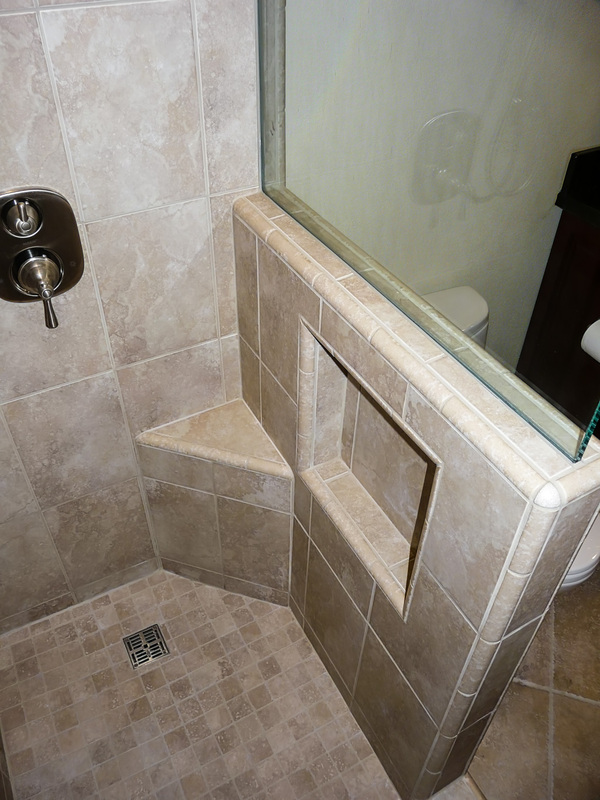 You’ll see the shower has a built-in seat and a shower step on the opposing corner, both of which are critical elements in our functional bath design concept. Additionally, the interior of the pony wall has a recessed shampoo shelf so the stuff you store on the shelf is easily accessed while staying out of sight from everywhere else in the room. 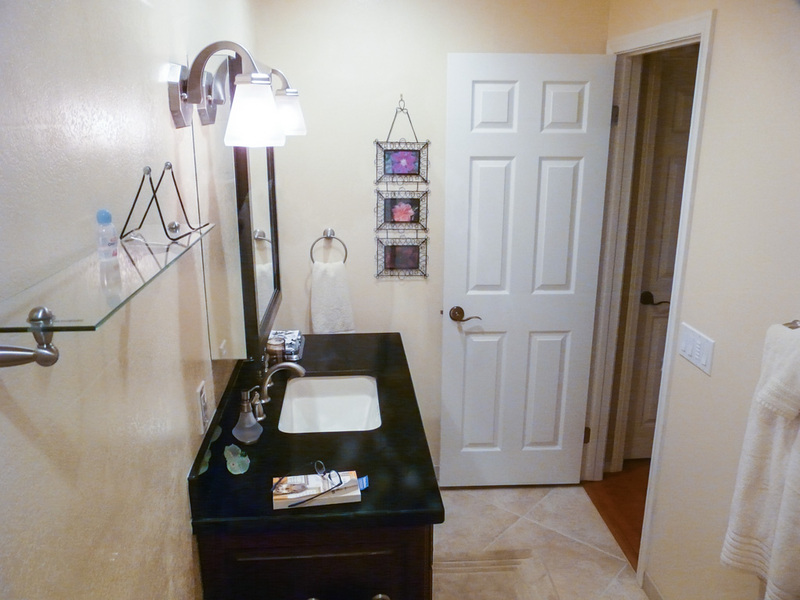 What point is there in having a powder room if you see personal care products as soon as you walk into it? Using this configuration, you see a beautiful tile surround with pattern inserts along the shower walls when you walk into the room, something that’s pretty and not the clutter you’d prefer to stay hidden. 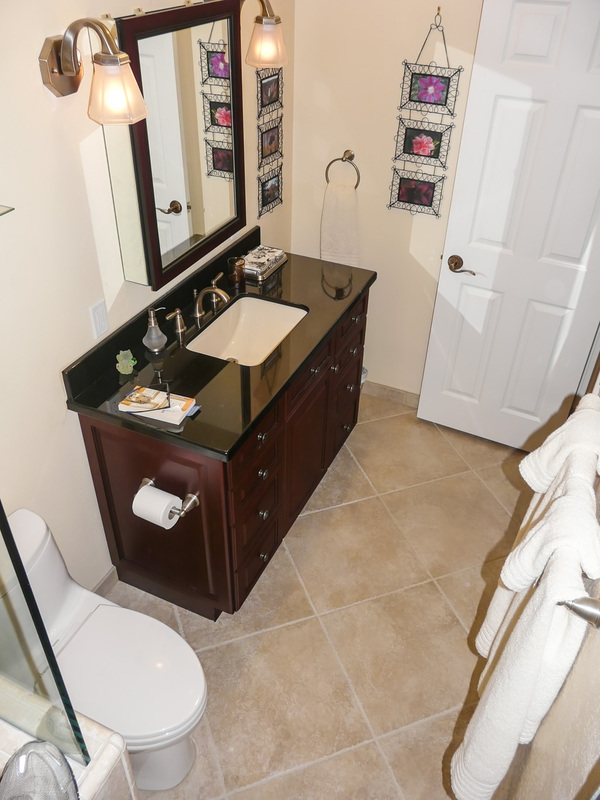 In essence, it’s a guest bath/powder room that works really well, using only the necessary functional bath features to meet the client’s needs.